Removal of milk teeth in children often occurs at home. Most parents do not consider it a reason to visit the dentist. And not all children are ready to go to the doctor so often. If you decide to remove a milk tooth at home, you should observe some rules. Feed the baby before removing. After removal of the tooth will need to abstain for some time from food. After eating, the child should thoroughly brush your teeth. This will reduce the number of bacteria in the oral cavity. One of the most common ways to remove a milk tooth with a thread. It should be used when a tooth is pretty well shattered. If the tooth sits in the gum tightly - this method will not work! The tooth tied with strong thread and jerk in the opposite direction of the jaw. It is not recommended to pull in the side. This increases the risk of damage to gums. Pull need to confidently and sharply. Longer, but less traumatic, is the way when the tooth is gradually loosened tongue or fingers. It takes the painmore time, but does not cause fear in the child. After the tooth is removed, mouth must be rinsed with antiseptic liquid. For example, chlorhexidine. Not be amiss, for 5 minutes put a cotton wool soaked in it . To eat after that is not earlier than 2-2. 5 hours. You need to give to heal the wound on the site of an extracted tooth. It is not necessary to distract the child, and sharply to press a finger on a loose tooth! You can not calculate the force and cause the child pain. And the tooth can remain in the old place. 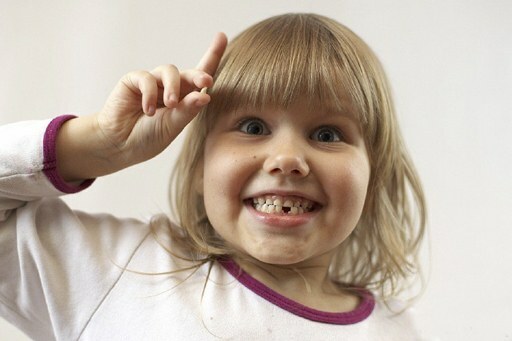 If the tooth in a child reeling for a long time, but sits firmly in the gum, it is not necessary to remove it at home. In this case, the trip to the dentist will be the right decision. Immediately consult a doctor, if after removal of tooth at home there is a strong swelling and redness of the gums. If the child is small, all manipulations should be beat like fabulous effect. Tell the child that the old tooth has already served its purpose. It is necessary to give the mouse or the tooth fairy. And in return the baby will grow new, strong tooth.